Our focus in dance this half term has been Bollywood dancing. The children have all loved learning a new style of dance. In our last lesson today we were able to perform our dance to Miss McKinnon’s Class. On Wednesday, we were all very excited as the day finally arrived for our residential! To mark the 26th anniversary of the Warrington bombing, the Peace Centre invited our class to attend a ceremony. During our stay, we played lots of different team building games focusing on our Christian value ‘fellowship’ and many skills such as communication and listening. All children and staff thoroughly enjoyed our stay and were absolutely exhausted come Thursday evening! Our class focus in British Science week has been creating awareness of plastic pollution. We were all very shocked at how severe plastic pollution is across the globe and the impact it is having on our environment. Did you know that it takes 450 years for plastic to decompose? On Friday, we discovered that the chemicals which cause plastic pollution are also found in synthetic products such as nylon and polyester! Together, we conducted an experiment to see the impact of washing synthetic clothing has on our ocean! As part of British Science week, we welcomed ‘Science Boffins’ into school for a workshop. We learnt about electricity; which materials are conductors and insulators and how we are a conductor for electricity! In addition to this, we investigated what happens when different chemicals are mixed; creating steam, explosions and foam! We concluded the session by creating our own slime! As part of our ‘Westbrook Detectives’ topic this half term we enjoyed having a D.T day! This involved: planning, designing and creating our own building for Westbrook. We looked at different materials that are used in the construction world, their properties and how they are used. We discussed the importance of builders creating a framework for their building and had a go at creating one out of lollipop sticks! We were all very happy with our final product! Our focus in dance this half term has been country western dancing. The children have all loved learning a new style of dance. In our last lesson today we were able to perform our dance to Miss Evan’s Class. In English this week we have been learning about refugees. We have discussed the difference between migrating out of choice and being forced to migrate due to a natural disaster or war. Today we worked in small groups, each group chose their family name and their role. A series of scenarios were told whereby the families had to evacuate their homes and begin their journey as a refugee. As the scenarios developed the families realised the struggles they would face and how they would feel. In our badminton lessons this half term we have looked at how technique, power and co-ordination can help develop us as a player. We have learnt the different shots which can be taken (smash, serve, drop) and how we can effectively communicate with our partner to win a game! We had a fabulous visit from United Utilities today, teaching us all about the Water Cycle! We have learnt what the water cycle consists of and how the water is filtered to ensure that it is safe to drink from our taps! We looked at all the different ways we use water and how much we waste. We all made a promise to help reduce the waste of water in our homes, whether this is something as simple as turning off the tap whilst we clean our teeth! During our Geography lesson this morning, we had a trip out to Westbrook to ask the public a series of questions on what they think of the area. We asked them what they thought of the area and how they think Westbrook could be improved. We also conducted a traffic survey and asked the public how they commuted to Westbrook and how far away they lived. We recorded our results in a series of tally tables. We are all looking forward to completing a graph to show our results next week! As part of our Health and Well being week, we participated in a zumba class! We all enjoyed learning a range of dance routines and had lots of fun whilst being active! 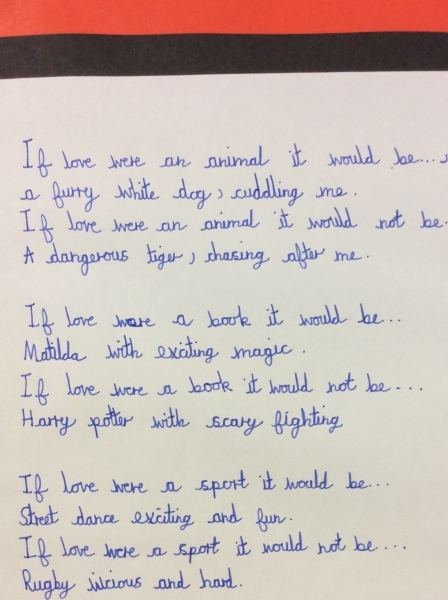 This week in English we have been learning about poetry. 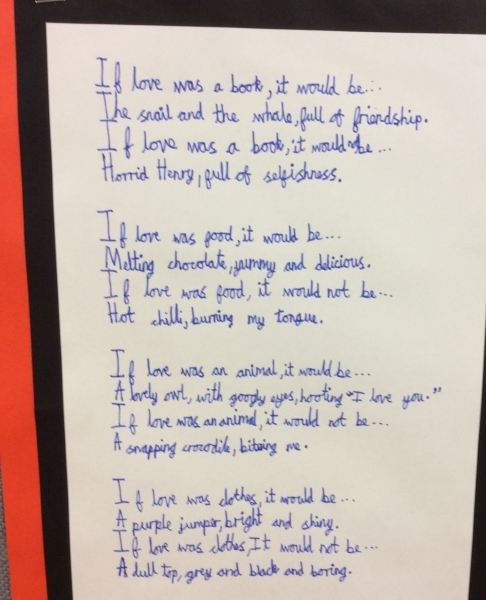 We have looked at the different forms of poetry and their features. Today we prepared and rehearsed a poem, understanding how the tone/volume of our voice and how our actions can help engage the audience. We then performed our work to the rest of the class. Today we started our new science topic ‘states of matter’. We learnt about the atomic make up of solids, liquids and gases and understood different materials state of matter. Further to this we investigated ‘gloop’, which was made from cornflour and water. Identifying that it formed a solid when untouched and transferred into a liquid when played with. We incorporated drama into our English lessons this week as we retold the story ‘The Fourth Wise Man’. In RE we made our own Christingle! We learnt about the meaning behind them and what each part symbolises. Great fun has been had during our English lessons this week. Researching the features used in persuasive texts and understanding how to target specific audiences. We did this by looking at a variety of medias, such as: TV, magazine and radio adverts. In small groups, we had great fun creating our own advert! We have had a fabulous day today, welcoming ‘Bright Sparks’ into our classroom for a science workshop on ‘Electricity’. We learnt all about circuits, the components required and how to construct them. Further to this, we then researched what would happen if we added extra bulbs to our series circuit and investigated how the impact is different in a parallel circuit. Our focus during swimming this week was on survival! We really enjoyed wearing our clothes in the pool and realising the impact that wet clothes has on our ability to swim. We participated in many team building activities, both as the victim and the rescuer! Our focus in DT has been about Healthy Eating. The children devised their own healthy eating plate and compared foods to those of the Roman times. We ate our very own Roman banquet! The children analysed each food commenting on the texture, taste and aroma. The children then planned, made and ate their own Roman meal. History: What did the Romans eat? We were keen to find out what the Romans ate, so Miss Boden created our very own Roman Poo. In small groups we investigated which foods were included. We had an amazing day in Chester! We looked round two galleries, took part in a workshop and dressed as Romans, whilst we marched and chanted through the streets of Chester! The children were taken to the amphitheatre remains where they learnt how to fight as a Roman and charged against the enemies (adults)! 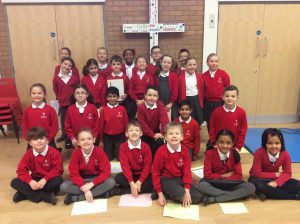 Over the past two weeks we have been getting to know each other and have created our own class charter. 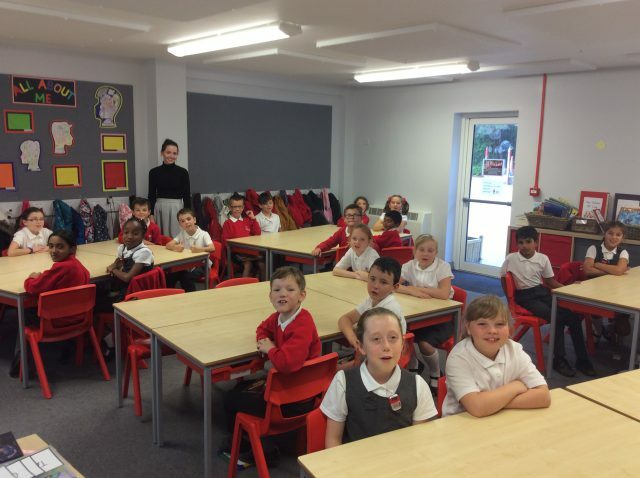 It is lovely to see how well the children have settled into their new class and are excited for their new learning! The sun was shining this morning as we walked the short distance to the orchard. There we were met by Mary and Kev from the Land Trust who led our session. We learnt about the different plants and how they adapt to their habitat. We also looked at how plants compete for space and how they make seeds. There were so many exciting differences to spot. We had a fantastic time and impressed our hosts with our scientific knowledge. We are looking forward to a return trip in autumn to harvest the fruit, so we are keeping our fingers crossed that the birds don’t eat it all. 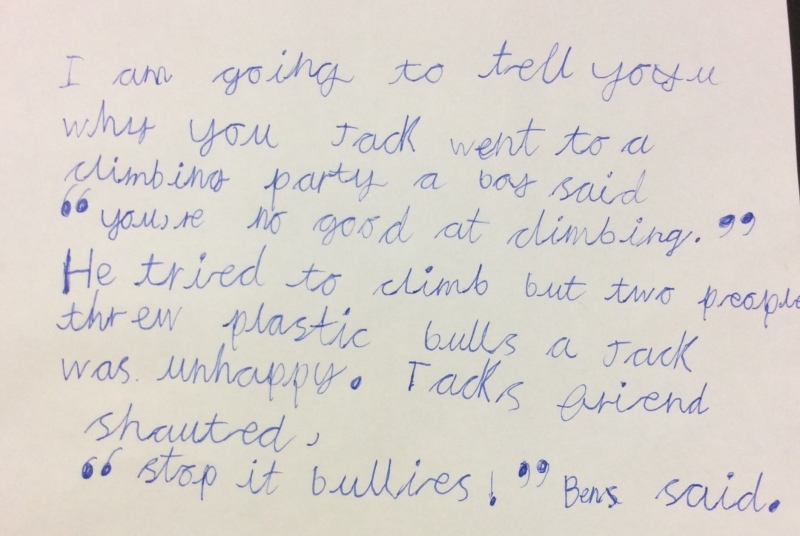 In English lessons we have been using the book, ‘Escape From Pompeii’ to inform us about the devastating effects of volcanoes and support our story writing. Today, the children used drama to develop their ideas and to consider what daily life was like in Pompeii before the eruption. We had an exciting morning working as engineers and designers. The children learnt how to program an electronic device to perform a series of actions. They then added lego pieces to build a fairground ride, they added images, words and sounds to enhance their design. Throughout the activity, the children had to problem solve and debug when things didn’t go as planned. Take a look at our finished creations. One of our PE topics this half term is rugby and we have been incredibly lucky to have the support of Wil, a talented coach from the foundation. He is going to work with the children to develop their playing skills and develop their collaboration and teamwork. Today was fabulous! Active Cheshire set up an amazing afternoon of events for us to encourage more physical activity and help us to get fit and stay healthy. They are going to continue to work with us next year as we complete the 100 mile challenge. Science – What is light? This is the question posed to the children to begin our new science topic. We use dark tubes to see what happens when we remove light and then thought how we could change them so that we could see the object that had been hidden at the bottom. We have learnt a great deal about Ancient Greek culture and today we had a go at making clay pots in the same way that Ancient Greeks would have made them. We are looking forward to decorating them when they have dried. As part of our science topic, we looked at a huge assortment of seeds and thought about how they were designed to travel away from their parent plant. The children found examples of seeds that floated on water, got attached to animals or eaten by animals and seeds that travelled on the wind. What a wonderful day we have had, taking part in wonderful drama activities to learn about the lives of people in these ancient times. We took part in two drama workshops. One was hosted by an Athenian lady, and the other by a Spartan. We played games, and learnt about life in each city. At the end of the day, we voted on which city we would like to live in. Athens was the winner! Perhaps the black soup put our children off living in Sparta. Today we celebrated what is fantastic about our nation. We thought about what makes Great Britain great, and what makes each of us individual and unique. At the end of the day we had a debate to consider if individual liberty is something that we agree with. Overwhelmingly, we agreed that being able to speak your mind, and celebrate your individuality is a good thing so long as we stay within the law. What a disaster! A crime has been committed in our class rooms and plants have been killed! Our science topic this half term is all about plants and today we discussed how we know that plants are living things. We labelled parts of each plant and thought about the job of each plan part. Becky, our dance teacher, has been impressed by the commitment from the children to learn this new style of dancing. Their final performance was watched by other year groups, and the comments form the older children were fantastic. Our focus in art has been learning to draw facial expressions, and Manga has helped us with this. The children have loved exploring the style, and using their sketch books to record their ideas. Their final pieces were wonderful. This half term, we have learnt how to use a shot put and javelin. The children’s throwing skills were impressive, and we held a competition to see who could throw furthest. We were really lucky today as Ethos Group organised a treasure hunt for all of the classes. There were clues hidden all around the school which we had to find, and then solve the riddles. We completed the challenge successfully and were rewarded with a tasty treat. Today, we had a wonderful morning meeting Andrew Glennon, a local author who has written a wonderful book, ‘The Loneliest Robot’. Andrew told the children about the inspiration for his book, and how he invents new characters. The illustrations he brought in to show us were magnificent, and we all agreed that Matt Dixon is extremely talented. The highlight of the morning was listening to Andrew read the first chapter with some help from us. We are all really excited to find out what happens next, and write our book reviews. What an incredible week we have had investigating so many different things in so many different ways. On Monday, Science Boffins came into school to launch Science Week, and showed us some exciting experiments. In the afternoon we were delighted to have a visit from the education team from Air Products. They taught us about gases, and demonstrated the effects of liquid nitrogen. It was very exciting. Later on we made slime and recorded our observations at each stage. We drew labelled diagrams and wrote notes about what we could see, hear and smell. On Tuesday, we learnt more about forces and how they make a balloon rocket fly. We worked with our groups to try and make our rocket balloons fly faster. We changed the angle of the string, the size of the rocket straw and the size of the balloon engine. On Wednesday, we worked outdoors to count the different birds that we find in our local area. We were surprised at how few birds there were in the afternoon, so went back outside the next morning. There were lots more then. Lucy thought that they must be coming to eat our snacks from the playground. When we returned to class, we recorded our results on bar graphs and pictograms. On Friday, we explored the local environment and collected items that represent nature in Westbrook. When we took these back to class, we looked at each object carefully using magnifying glasses and microscopes, and sorted and grouped the items using descriptive vocabulary. In Year 3, we learn about different types of fiction; how story books can be ordered depending on their theme. During our visit to the library today, we had a treasure hunt searching for books from different genres. 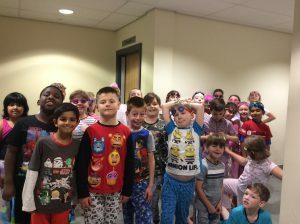 The children looked fantastic in their costumes, and lots wore pyjamas and brought in a favourite bedtime story. The day was filled with exciting activities, but most importantly we shared some wonderful books and stories, and really thought about the magic of books. Whilst others were tucked up indoors, we were enjoying the fun of the snow. We went out with the other year 3 classes and tried our hardest to make snowmen and snow angels. We are keeping our fingers crossed for more snow soon. To end our topic, we held a day to celebrate the Ancient Egyptians and learn some more exciting facts about them. We held an Egyptian banquet and feasted on foods that the Ancient Egyptians would have enjoyed. The children learnt a dance about the gods; made mummies from modroc, used hieroglyphs to break codes, and designed their own death masks. The day was full of exciting learning and was a wonderful way to end the half term and the topic. 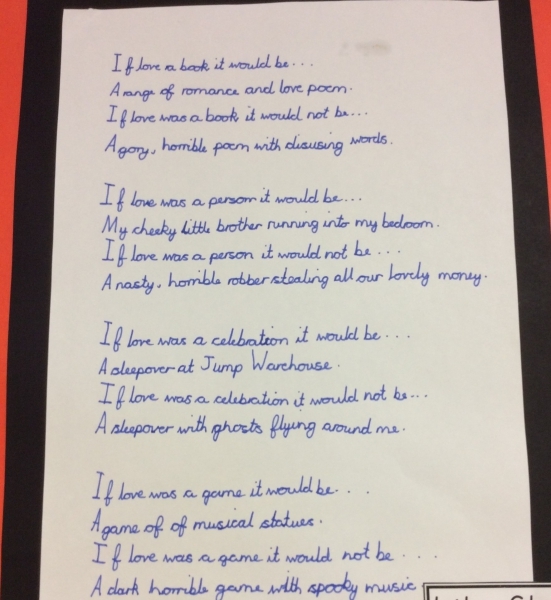 We are proud of our bespoke curriculum in our school which is led by the children’s questions. Our class wanted to learn how the pyramids had been built. We used the internet and video to research the techniques that the Ancient Egyptians had used and then used sugar cubes to build our own pyramids. It was not as easy as we thought. As we have now concluded our dance topic, we performed our finished dance to the year 6 children. Everyone was fantastic and the older children were impressed bu our performance and made complementary comments. To end our PE topic, we had a morning of competition. We split the class into teams and played games against each other. Everyone played in the true spirit of the game, congratulating those who scored and encouraging their team mates to try their best. The children performed magnificently today in our class assembly. 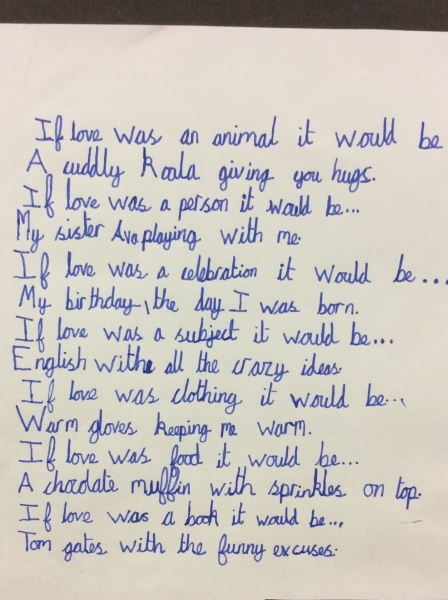 The focus was love and the children talked about what they love, different types of love, and the wonderful things that they can achieve with the love of those around them. 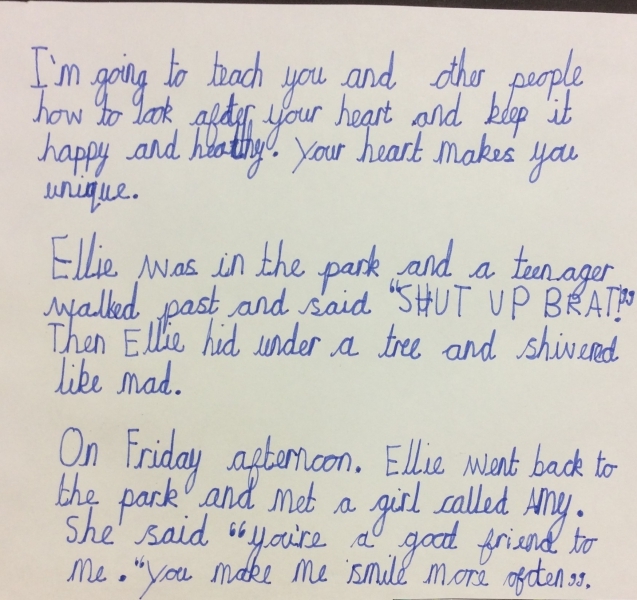 They shared singing,dancing and lots of their writing: poems, stories and recounts of their trip. Everyone at school is very proud of all the hard work that they have put into their lovely assembly. We have been so very fortunate to work with a fantastic artist this week. Every child has been part of producing some wonderful art which is soon to hang in our hall. We have been looking forward to this all half term, and we were not disappointed. The day was a fabulous learning adventure from beginning to end. The children explored the many floors filled with interesting activities; they wore lab coats in the science lab where they learnt how to be scientists; and they took part in a workshop to investigate magnets. The children behaved magnificently and showed the enquiring minds that St Philip’s children have. 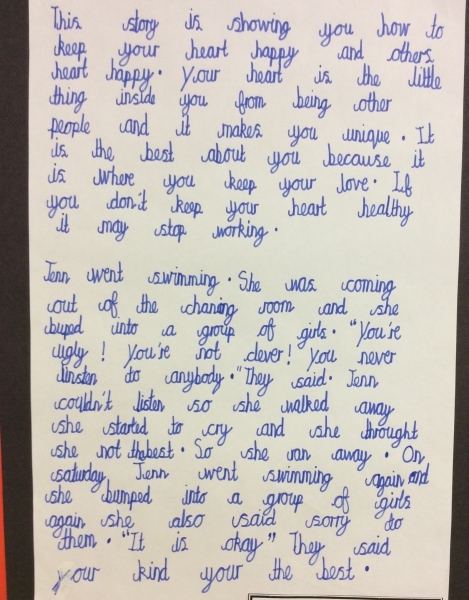 As part of Health Week, and in preparation for our school assembly, the class have produced some wonderful writing. They were inspired by the book: Words and Your Heart. We have learnt that forces make things stop and start, but today we thought about gravity. Gravity pulled the marble towards the floor without us pushing or pulling the marble. The children were given a challenge to slow down the effect of gravity. They did this by designing a series of ramps to slow the journey of the marble. The children worked on a very important science skill: Trying different things out to find an answer. They worked as teams to design their marble run, and then tested to see what went well. They recorded their observation and then redesigned and retested. They enjoyed working like real life scientists. This week has been incredible. We have learnt about nutrition; what we need to put into our bodies to stay healthy, and what happens if we eat too much of the wrong types of food or too little of some foods. We have been physically active every day; had a very exciting visit from England pro footballer, Sue Smith and made our own healthy hummus. Our debate about sugary drinks led to a class vote, and the majority agreed that sugary drinks should not be allowed in school. A highlight of Friday was Wil’s visit. Wil is a fabulous inspiration to us all. He works for Warrington Wolves Foundation, and has completed many incredible achievements, including climbing the 3 peaks in under 24 hours. Our PE topics are exciting this half term, and the children are developing a range of skills. In all of their PE lessons, they are thinking about the effect that fitness has on their bodies, and why exercise is so important. One of the things to focus on is how working together can improve your performance. This is proving successful. 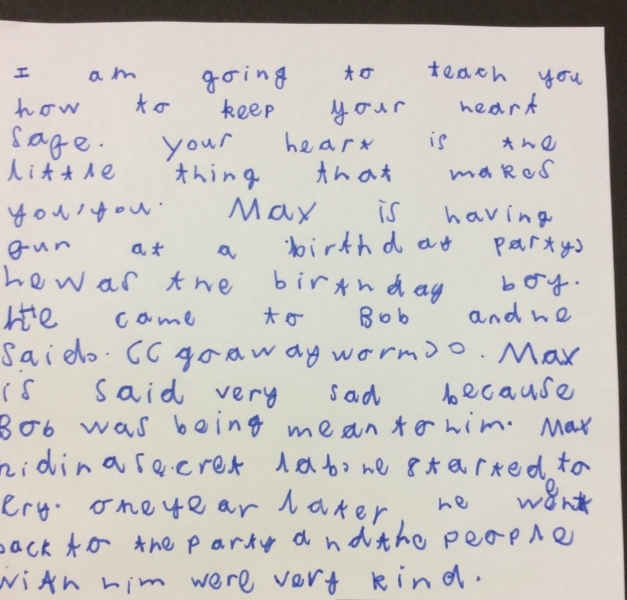 It is fantastic to listen to the children giving each other positive feedback and praising hard work. Last week we learnt that objects stay still unless a force acts upon them. We looked at examples of pushes and pulls, and thought about how they can make things start or stop. This week’s lesson was lots of fun, and forced us to use our learning style of collaboration. We were given the challenge of moving the cups to make a pyramid, but we were not allowed to touch them. We could use the elastic bands, but two people had to move each cup. It was exciting to work like real scientists. We thought about what we would do, and wrote our ideas down. Then we tried those ideas out. We recorded what did and didn’t work, and thought of new ideas. We kept on repeating this until we came up with a successful plan. This week we have been trying a range of different methods to learn our times tables. By the end of the year, we need to know x2, x3, x4, x5, x8 x10 and all of the corresponding division facts. We have played games and made lotus flowers and had fast recall tests. One of our PE topics this half term is softball. In our first lesson we talked about which skills we would need to play this game, and learned to bowl a ball, strike the ball using our hands, and field to return the ball to the bowler. We had a fantastic last day. Our carols in the morning were wonderful and put us all in a good mood for our party. We played lots of party games and made snowmen decorations from socks, but a highlight was a surprise visit from Miss Tomlinson. Our Christmas performance was fantastic! Than you to all of the children for working so hard to learn their lines, dance moves and songs. Everyone enjoyed watching, and you looked wonderful in your costumes. The message was delivered loud and clear. Whilst there’s lots going on with presents, shopping, dinner and family, the most important thing is the story of how that special baby came to save us all. This half term, we have designed our own Spanish breakfasts. We learned the Spanish names for a range of food and drink and worked with the rest of our group to make a tortilla. The children practised chopping, slicing and dicing, and mixing ingredients. The classroom smelt incredible, and other teachers kept popping in to see what we were up to. Each of our maths lessons begins with a problem which the children unpick with their partner. The use of counters, blocks and other tools is vital, and supports the children’s thinking and develops strategies for them to use to solve the problem. We are always amazed by the number of different ideas children come up with to find an answer. This week we have been thinking about investigations that involve looking for a pattern. Is there a relationship between two factors. After looking at pictures of Olympic athletes we asked the question: ‘Do people with longer femurs jump further?’ The children planned their own investigations and recorded a prediction before conducting their tests. The children had to use scientific skills to measure their femurs and the length of their jumps accurately, before recording their work. Following on from our skeletons lesson, the children were curious to learn how our bodies moved. To help us to understand this we dissected chicken wings to examine how muscles and bones work together. The children were fascinated to see how the movement of a muscle affected the bone. This half term, our topic is all about Spain. The children expressed and interest in learning abut Spanish food, and so we decided to research Spanish breakfasts. The children in Spain often have breakfast much later than us and tortilla is a tasty favourite. Today we have planned our tortillas. The children took great pride drawing and listing their ingredients. They thought about how they would prepare each ingredient, and wrote a method for cooking. We are all looking forward to next week when we will get to make them and share a traditional Spanish breakfast. We begin each new science topic with a lesson we call, Wow, Awe, Inspire! 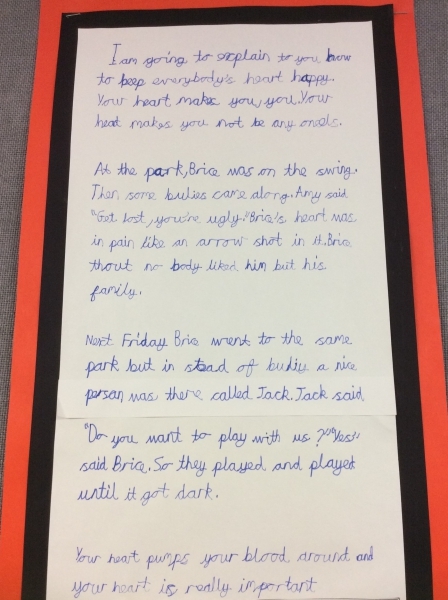 This is an opportunity for us to engage the children in their new topic, and allow them the opportunity to raise questions, and think about what they would like to learn. We can then make sure that we teach to the children’s interests. Take a look at the wonderful representations of human skeletons that the children were able to make, before their learning begins. Although not completely anatomically correct, they were fantastic, and I was excited to see the children working together as a team and sharing ideas. How many bones are in my feet? How does a skeleton make me move? What would happen if I didn’t have a skeleton? Does everyone have a skeleton? All week, we have focused on the theme of remembrance in our writing. 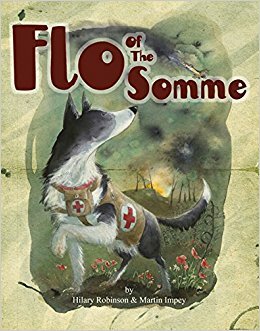 We used the wonderful book ‘Flo of the Somme’, and we learned that war involves animals as well as humans. In World War 1 over 50,000 dogs were used. Flo was a mercy dog, sent into danger to search for injured service men who were in need of help. A wonderful book. A poem which tells the adventures of Flo the mercy dog. 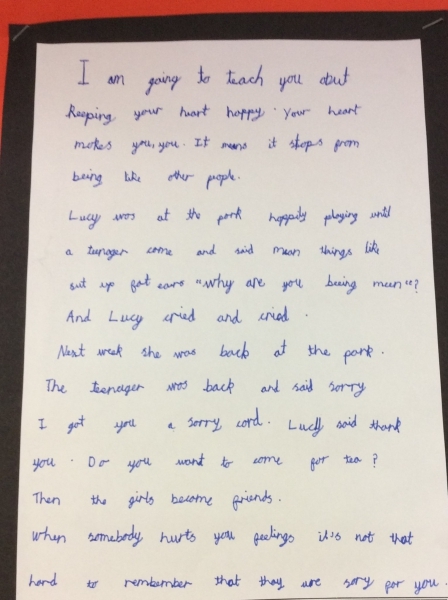 The children wrote some wonderful poems, thinking about what Flo may have experienced. They also designed some beautiful artwork to remember the bravery of those who serve for us using the poppy as their inspiration. Today we used Starburst sweets to investigate how different types of rocks are formed. We have already learnt that rocks can be classified into three groups, igneous, sedimentary and metamorphic. We looked at what happens when intense heat is applied – bubbles can be seen in the rock (Starburst) and the different colours mix together. We applied pressure to make representations of sedimentary rock, and heat and pressure to make metamorphic rock. The classroom smelt very fruity at the end of our lesson, and we could all explain how rocks are made. Reading is incredibly important, but should also be fun. Today we visited our local library. We enjoyed taking time to share new books and talk about them with our friends. We brought some of our favourites back to class to help us with our topic and to share at story time. 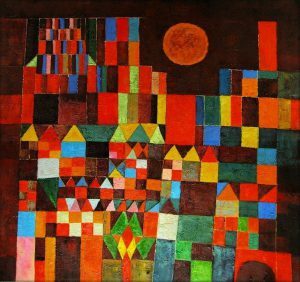 We have looked at the work of the artist Paul Klee, and learnt that he loved to use bright colours and geometric shapes. We liked his picture ‘Castle and Sun’, and have used wax crayons and an ink wash to imitate his style. We took our time to draw our castles. Usually, we would not use a ruler when drawing a piece of art, but because we wanted nice straight lines, we used a ruler, and took our time to build our pictures from the bottom of the page. Harry said, “Just like you would build a house .” The children are very proud of their art, and we plan to use digital images of famous Warrington buildings next week and reproduce them using the style of Paul Klee. We started our new PE topic today, and the children demonstrated that they had learnt a lot about gymnastics in Year 2. They used basic gymnastic shapes – star, tuck, pike and straddle, The children balanced alone and with their friends. Wow! The children looked incredible in all of their amazing costumes. 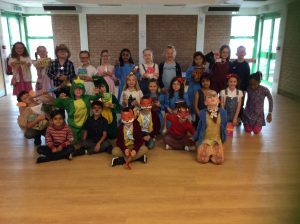 We spent the day focusing our activities on the stories of Roald Dahl; in particular Fantastic Mr Fox. You can see from our photographs that we all enjoyed the drama workshop. 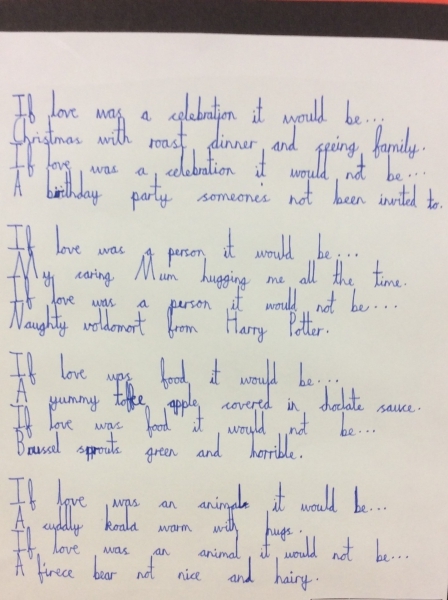 The children used alliteration to introduce themselves and their friends, and had to work in groups to make poems that rhyme. Today we launched our science topic – Rocks and Stones. The children brought their favourite rock into school, and we examined them closely, comparing their similarities and differences. The children were excited to see the huge variety of stones and rocks, and thought of different ways of sorting them.